I was looking forward to putting together a small party for my son Jacob who turned one (already?!) at the beginning of this month. I love Pinterest for gathering inspiration, but browsing Pinterest can give you some really high expectations for what a child’s birthday party should be like. However, Pinterest-style parties can come with $$$ price tags (have you seen the kid parties that cost more than small weddings?!). 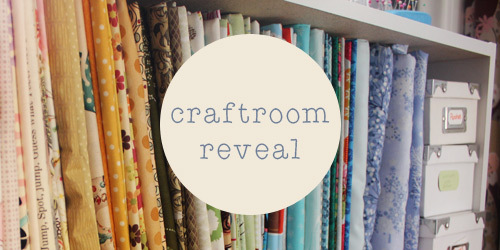 Additionally, those plentiful Pinterest crafts can take a lot of time – time that is more valuable than money. 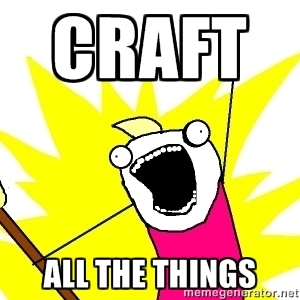 I know, I run a craft blog: I should want to craft all the things! I just haven’t been able to get myself into that crafty zone lately. At the end of August, I came down with a cold that beat me down for 3 weeks. I barely did anything other than sleep, take care of my son, and try not to cough up a lung. I coughed so hard I pulled a muscle in my side. Even now, weeks later after my cold is gone, every time I laugh or sneeze, my side is in pain. I feel like an old woman. Needless to say I haven’t felt like my crafty self lately. We didn’t end up doing a formal photoshoot, but we got this snapshot on the couch. Little Man didn’t cooperate with a smile for this one. A cheerful number sign that is about the size of my child that has a pleasing, natural texture. 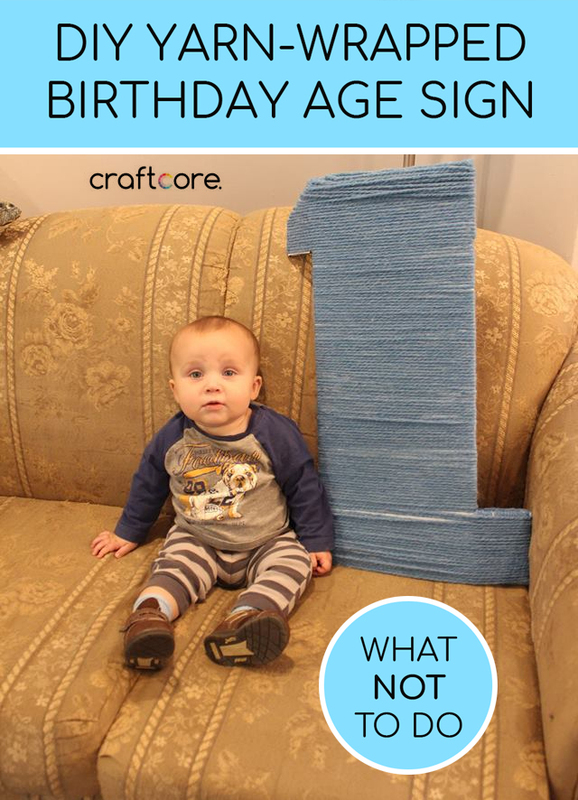 A bumpy number sign that is too fragile to be at a party with children present. If a child pulls the yarn, gaps show. I created this out of a cardboard diaper box cut into the shape of a 1. I wrapped it with a leftover ball of yarn and used hot glue to tack it in place at the sides. 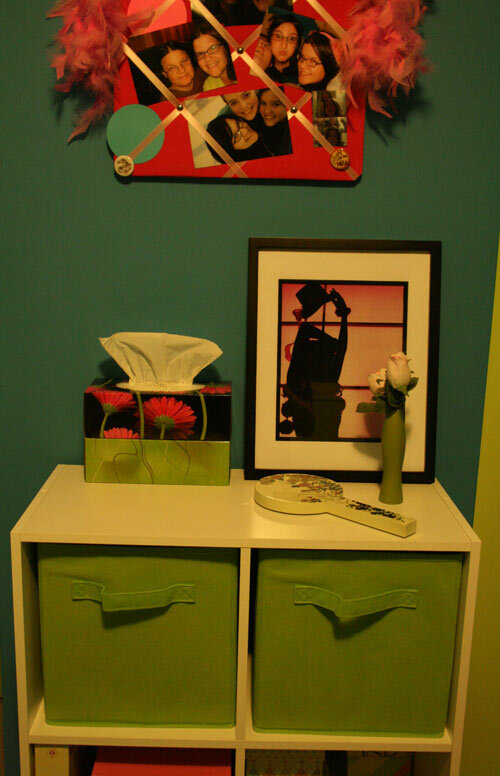 If I were to do this project again, I’d cover the cardboard with coloured paper that matches the desired yarn colour. Heck, if I did it again, I think I’d skip the yarn and just paint a cardboard number. Ha! It took quite a while to make for something so simple, and as I mentioned, it was a little fragile. A perfectly iced miniature cake, perfect for a cake smash photoshoot. I absolutely love smash cake photos. Babies are so cute when they’re getting messy! I had originally planned to make a Sesame Street Cookie Monster cake with a vintage 1970s Wilton cake pan plus a mini round cake to match for smashing, but being sick, I didn’t want guests to have too much germ transfer. I decided to only bake a mini cake for my baby (he already had plenty of germ exposure, unfortunately) and buy premade cupcakes for our guests. Everything came from a box; I used a confetti cake mix for the base and a canister of premade icing. To make the smaller cake, I used a pair of small square casserole dishes instead of cake pans, then used the remaining batter for a half dozen cupcakes. After baking, I cut the tops of the cake off, iced between the layers, then stacked them for a cute square mini cake. Perfect size for smashing! The icing, though! Canned icing is fine if you’re spreading it, but it doesn’t have body. It doesn’t really hold its shape when you use a piping bag. 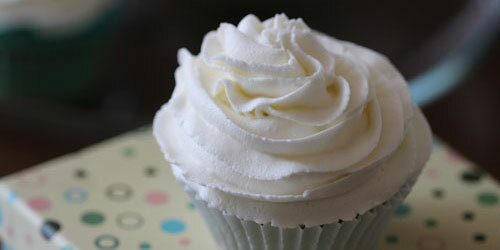 I added extra icing sugar to the canned frosting, but even so, it didn’t hold its shape well. I added just a few drops of food colouring because I didn’t want the colour to be intense. Strong food colouring can stain clothing. I made roses by piping spirals. I think if the icing held its shape better, it would have looked quite cute. When piping the sides, it felt like the icing was going to fall off. All the roses turned out pretty droopy. Somehow I also ran out of frosting – how did I use an entire can of frosting on this mini cake?! 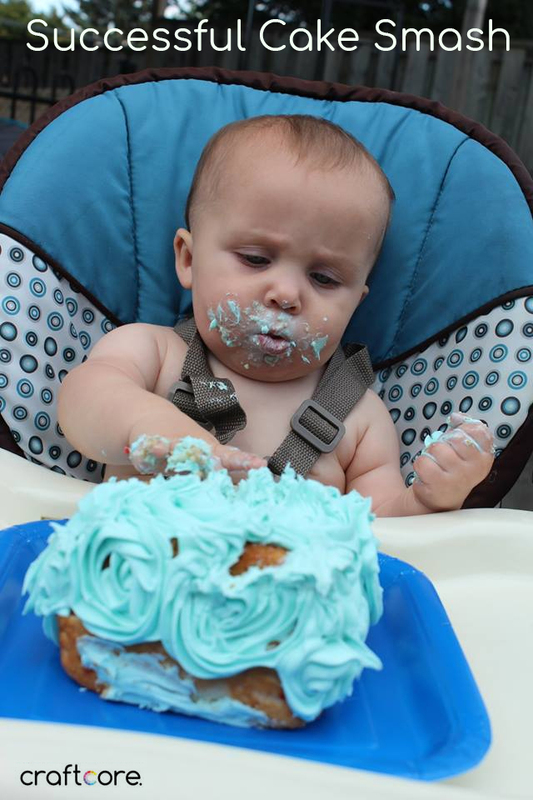 Despite the cake being a #cakefail, it served its purpose and my baby didn’t care what it looked like anyway. 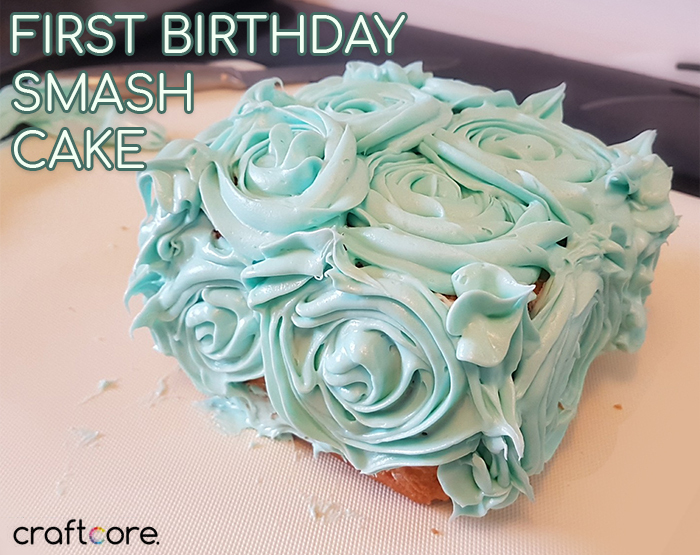 You don’t have to make a perfect cake for a cake smash – it is getting smashed by a baby, after all! A charming decoration that highlights the birthday boy and hides the inevitable under-the-highchair mess. I honestly think this met my expectations! 1 out of 3 ain’t bad, folks! This is the face of a boy who has skipped his nap to party with family and friends. I spelt out “ONE” across three banners. to decorate the highchair of my birthday boy. I used more of than blue yarn I had in my stash to make this simply highchair decoration. All I did was tie inexpensive ribbon to the yarn, alternating between a polka dot and a floral. 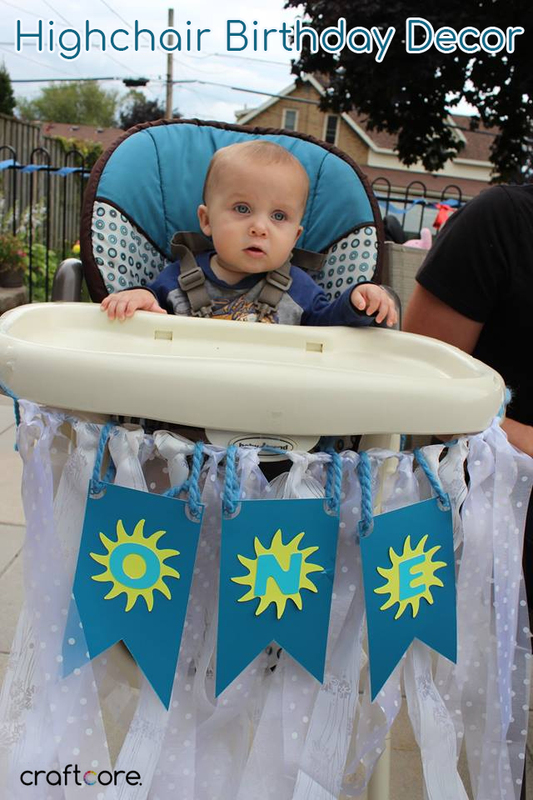 I then made some banners out of scrapbook paper and cut out suns and letters to write “ONE”. It was simple and effective. I wish I could have spent more time making things for his birthday party, but one can only do so much with the time and energy they have on hand. Next year I’m hoping I can go ahead and make his Cookie Monster themed party, but I know even then it won’t be a Pinterest-perfect affair. How do you handle birthday parties for your little ones? I’d love to hear your advice in the comments!